While designing and constructing custom swimming pools, there are many aspects that home-owners need to pay close attention to. One of these aspects is the depth of a swimming pool installation. Pool owners who have had a pool installed might have faced a little difficulty in finding the right pool design with the right depth. For others, it is a good time to know how to choose the depth of your swimming pool installation. On top of the responsibilities of choosing the pool’s texture, colours and other pool materials, home-owners should decide on their swimming pool installation’s dimensions. But if you are confused on how you should decide on it, consider the following while picking the ideal depth of your pool. What is the Purpose of your Swimming Pool Installation? People use their swimming pool installation for different purposes ranging from leisure activities to exercise. Your purpose of using the swimming pool is a crucial factor in determining your pool’s depth. Below we have mentioned the required depth along with the most common purposes to help you decide better. For Excercise- Such pools are longer in length to let you have long laps. This will require a depth of around 4 feet. For Family Gathering and Activities- Consider a pool with a shallow area that gradually moves towards a deeper end. Their depth usually range from 3 to 5 feet, making it a good choice for family gatherings with kids. For Diving- There are many who like to go ‘cannon ball’ or have a great dive in their swimming pool. Such pools require more depth, ranging between 8 to 10 feet. With the above-mentioned points, you can figure out and choose a depth according to the use and people using. If you are having a swimming pool installation for the very first time, we would like you to understand some important chemicals for your water that can help you have a healthy and memorable experience. 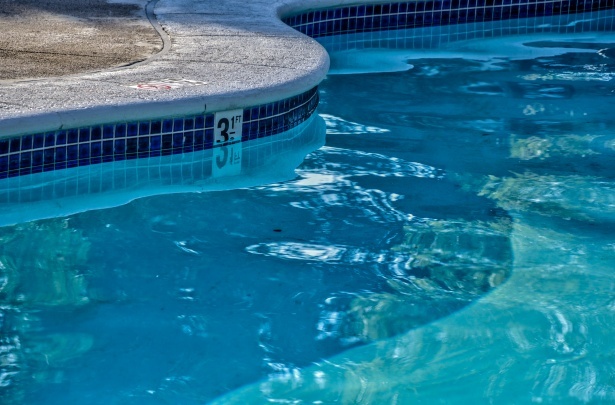 Keeping your swimming pool water clear, hygienic and clean is a tricky affair, specifically if you know nothing about the pool water chemistry and chemical products. To let your mind on ease, Land-con being one leading custom swimming pools designers in Toronto are here to help out. Imbalance in the pH level of your swimming pool water can cause irritation to your skin and eyes and also damage your pool equipment. Initially, you need to check daily on the pH levels and later when you have gained a bit of an experience, you can check less frequently. Chlorine or Free Chlorine (FC) acts as a sanitizer in your swimming pool installation, to keep your pool water germ-free and clean. If you are FC level is not appropriate, you risk to have algae formed in your pool, and once the algae set in, it is harmful to swim with it. Therefore, always test the FC in your water and try to maintain the level. Alkalinity defines the ability to buffer the pH level of your pool. It helps the pool-owners to have a better-balanced pool water for a longer period of time as it helps in keeping the pH level balanced and sustained. Want to have a custom swimming pool installation of your own? Hire the best swimming pool designers in Toronto with Land-con. We have over 20 years of experience in providing great custom pool results and offering maintenance for the same. Call us at 416.504.5263 or drop us a mail on info@landcon.ca to know more. Also, do not forget to ask for a free consultation!